Warm White: This brightly-lit kitchen features antique white kitchen cabinets, high ceilings, a central island with a prep sink, and beautiful wide-plank wood floors. 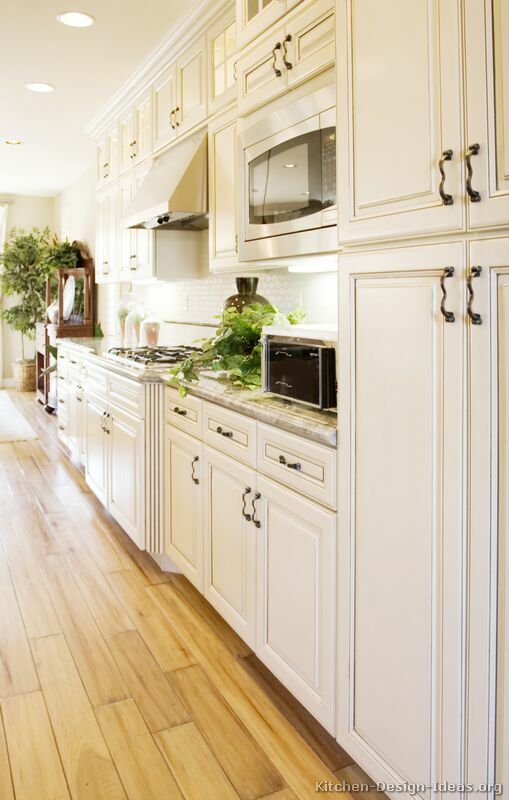 Light Luxury: Chocolate / coffee glazing adds character to the creamy white cabinet doors, while the antique brass cabinet handles have a slight squiggle design to them, without looking chintzy. Cabinets bump out around the cooktop with fluted (grooved) columns on both sides, for a furniture-like appearance. Underfoot, the light wood floor has a natural finish, adding warmth to the room while maintaining a bright color scheme. Green plants on the countertop and in the dining area add life and color to the open plan great room. Classy Counters: The polished granite on the island and main kitchen area contains beautiful blue, white, and gray minerals. 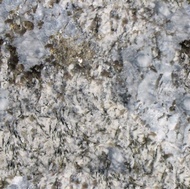 It appears to be Azul Aran (aka Blue Paradise), a highly prized and exotic granite quarried in Spain. 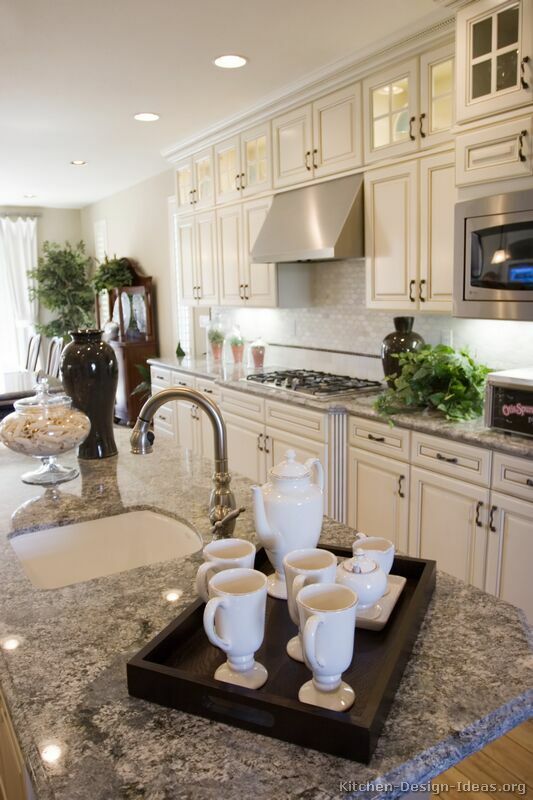 The ogee bullnose granite edge adds some shape and interest to the countertop while remaining easy to clean. Dreamy Design: The soft white backsplash contains a lower section of marble subway tiles, capped by a dark border tile. Above that, hexagon marble tiles in a mosaic pattern complete the subdued white backdrop. Even with its tranquil design, this kitchen is highly functional. A sleek stainless steel range hood provides plenty of ventilation over the gas cooktop. Back-lit glass display cabinets are mounted closer to the high ceiling, allowing the reachable cabinet storage space below to remain unimpeded. 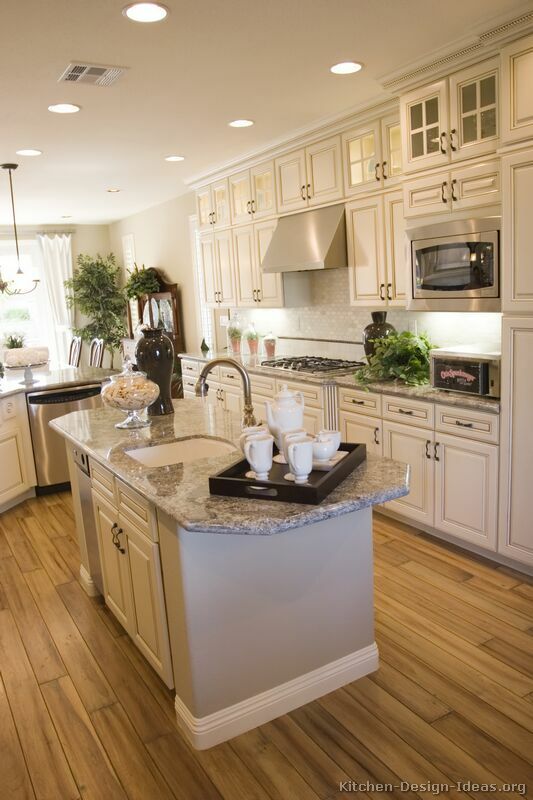 Ideal Island: The modest center island includes a secondary prep sink with a pull-out sprayer faucet. A trash compactor is conveniently located to the left of the prep sink. 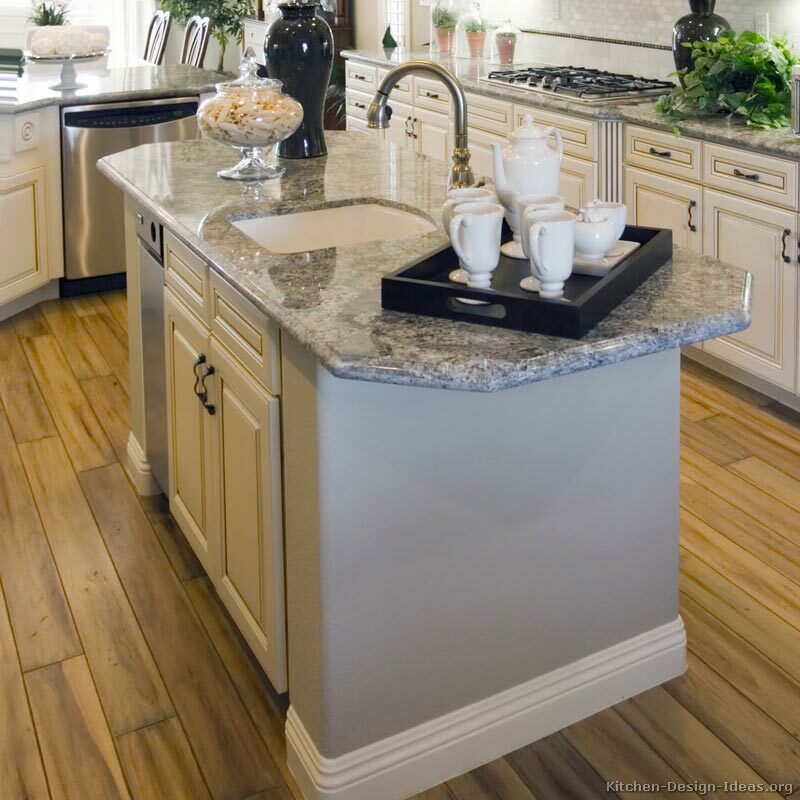 The island's granite countertop extends to overhang both sides of the island, providing additional surface area without encroaching on floor space. It also includes clipped corners for safer traffic flow. 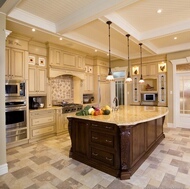 Similar Pictures: This kitchen is featured as photo #3 in the traditional Antique White Kitchen Cabinets gallery. 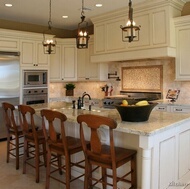 Stay Informed: You should follow Kitchen Ideas on Twitter to get all the latest news and happenings with this site. 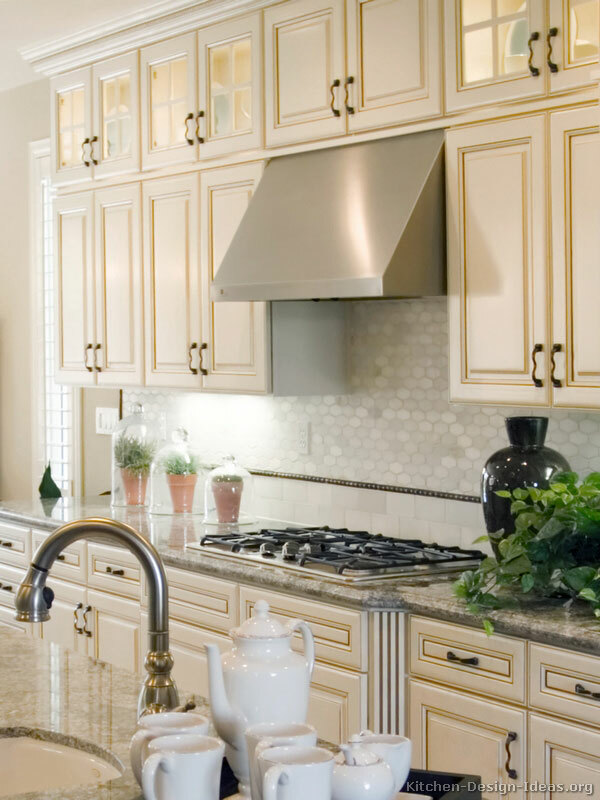 We encourage you to subscribe to our free Kitchen Ideas newsletter as well.